Goossens' signature [ from Aberdeen ], 1934; Schnabel's signature without place, 19 October 1934. The two signatories sign on separate sides of a 13.5 x 16.5 cm leaf of faded pink paper torn from an autograph album. In good condition, lightly aged. Schnabel's large firm signature is on the recto: 'Artur Schnabel | 19. X. 1934'. Goossens signs in a large bold hand on the reverse: 'Yours sincerely | Léon Goossens | 1934'. A small photographic portrait of Goossens, cut from a newspaper, has been tipped-in at bottom left, and another party (presumably the recipient) has written the word 'ABERDEEN.' at bottom right. [ Evacuation of Queen Mary College, University of London, to King's Cambridge. ] Autograph Journal of Jean Kilgour Hart, undergraduate of Queen Mary College, in two volumes, kept over a year during its evacuation to King's College, Cambridge. Cambridge [ Queen Mary College, University of London ]. First volume: 1 January 1942 to 9 May 1943. Second volume: 10 May 1942 to 29 April 1943. The two volumes of diaries of Jean Kilgour Hart cast light on the interesting wartime crossover between the Universities of London and Cambridge. On the evacuation of Queen Mary College to Cambridge at the beginning of the Second World War, both the College administration and male staff and students were accommodated at King’s College. Women staff and students were initially provided with accommodation at Girton College, but from 1940 they were housed in two private houses in Hills Road. [ Mona Inglesby and International Ballet. ] 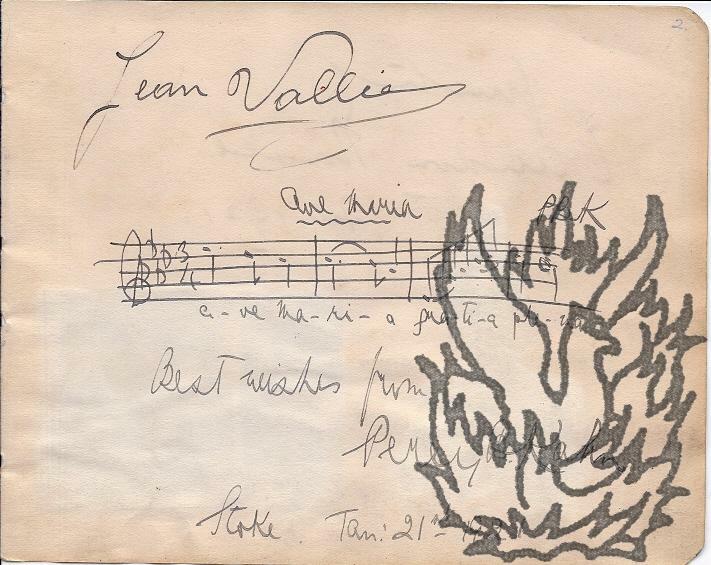 Autograph Signatures of Inglesby and 23 members of her International Ballet troupe, including Moira Shearer, Nina Tarakanova, Claudie Léonard Algeranova, Anna Marinova, Joyce Graeme, Rex Reid, Jean Harris. There has been a recent resurgence of interest in Mona Inglesby and her International Ballet (1942-1951). In 2008 Kay Hunter published a study of the troupe, titled 'Ballet in the Blitz'; then in 2012 BBC Radio 4 aired a documentary about Mona Inglesby and International Ballet, titled 'Black-Out Ballet: The Invisible Woman of British Ballet'. The writer of the documentary, Ismene Brown, gave the following explanation of her motives: 'In 2006 an elderly dancer died in Bexhill-on-Sea, Sussex. She was 88, and had once been one of Britain's most recognised ballerinas. [ Printed item. ] Les Quatres Problèmes Sociaux par Jean Izoulet. 31pp., 8vo. Disbound pamphlet. In green printed wraps. In fair condition, on aged high-acidity paper, in worn wraps, with a few notes in light pencil. The title-page is headed: 'Collège de France | Cours de Philosophie Sociale | Leçon d'Ouverture | (16 décembre 1897)'. On p.6 Izoulet writes: 'cette leçon d'ouverture a pour but d'expliquer l'origine et le titre de la nouvelle chaire, la nature et l'esprit du nouveau cours'. Now scarce. [ Jean Hyacinthe de Magellan, natural philosopher. ] Autograph Letter Signed ('Magellan'), in English, to the Earl of Buchan, on topics including Adair Crawford's 'new theory of heat in general'. 3pp., 4to. Addressed, with black wax seal, on reverse of second leaf to 'The Earl of Buchan at Kerkhill | by Edinburgh'. In fair condition, lightly aged. He is 'hardly relieved' from 'a very distressing ophthalmy withh great head-ackes [sic]', but thanks the Earl for 'sending the pamphlet of Dr. Homes on the Croup, for my friend Monsr. Le Roy, one of ye. Members of ye. Royal Acady. at Paris'. He is sending him the Philosophical Transactions, 'as regularly as they come out, by the indicated way of Mr. Donalson'. The 'Medal of ye late Captn. Cook [...] has not yet been distributed to ye. [ Société des Artistes Français, Paris. ] Printed and illustrated certificate, giving 'Mention Honorable' to 'Monsieur [sic] INGLIS (Jean)' at the painting section of the Salon of 1928. Signed by president Paul Chabas and secretary 'A. Bréauté'. Printed in black on one side of a 49.5 x 65 cm. piece of thick paper. In fair condition, aged and rolled into a tube. A tasteful design, featuring an engaving of a palm leaf. Signed at foot by 'Paul Chabas' and 'A. Bréauté'. [Printed item.] Séance du Sénat du 22 Juin 1865. Opinion de M. Le Procurer Général Dupin Sénateur sur Le Luxe Effréné des Femmes a l'Occasion d'une Pétition contre la Prostitution. Rapportée Par M. de Goulhot de Saint-Germain, sénateur. + 11, 16mo. In good condition, lightly-aged, no wraps, disbound, with slight damage to spine. The only copy on COPAC at the British Library. There is a copy in the Bibliothèque Nationale. [French botany in the eighteenth century.] 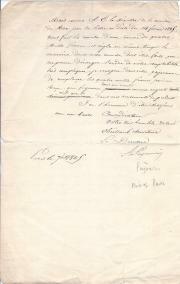 Autograph Letter Signed ('Granier'), in French, from Dr Jean Granier of Nimes to L'Abbé Pourret. Nîmes [France]. 19 May 1792. 2pp., 4to. 36 closely-written lines of text. Bifolium. In good condition, lightly aged and worn. Addressed, with 'NISMES' postmark, on reverse of second leaf, to 'Monsieur L'abbé Pourret | membre de plusieurs academies | à Narbonne'. The letter begins: 'il est bien tems me direz vous mon cher collegue que je vous donne de mes nouvelles, et surtout des plantes que que j'ai reçues de votre part'. He proceeds to give a detailed report, naming several specimens. 'Ballade de la Geôle de Reading'. [Numbered copy of livre d'artiste': a French prose translation of Oscar Wilde's 'Ballad of Reading Gaol', with drypoint engravings by Robert Fonta. [Paris.] Bibliophiles et Graveurs d'Aujourd'hui. 1950. 80 + pp., 8vo. Unstitched signatures with brown paper wraps and grey boards, both with text in red. In plain black paper-covered slipcase. On reverse of half-title: 'Il a été tiré de cet ouvrage, imprimé sur Vélin de Rives, 110 exemplaires numérotés de 1 à 110, réservés aux Membres de la Société des Bibliophiles et Graveurs d'Aujourd'hui. | En outre, dix exemplaires numérotés de I à X ont été réservés à l'artiste et aux divers collaborateurs de l'édition. | Exemplaire No 35 imprimé pour M. Jacques Le Désert'. [Charles Blondin, French acrobat.] Printed illustration (proof or letterhead?) of a tightrope arrangement, with two flags carrying the word 'Blondon', with English text of 'Explanations'. Charles Blondin [born Jean François Gravelet] (1824-1897), French tightrope walker and acrobat. On leaf of 4to paper. In fair condition, aged and lightly-creased. 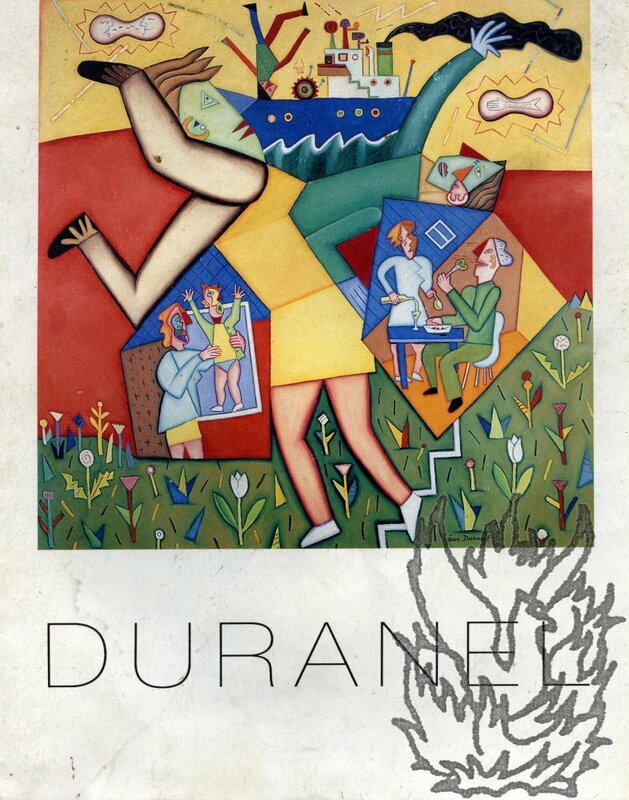 The purpose of the illustration is unclear, although it may be a proof or letterhead. The attractive engraving is in black ink, and 7 x 20cm. It shows two flagpoles, with a tightrope between them and apparatus to the right and left. Beneath the illustration are fourteen lines of text in two columns, under the head, 'Explanations', the left-hand column reading: 'From A to B, 600 English feet. | From C to D, 420 English feet. | From Mast to Mast, 300 English feet. | From E to F, 100 English feet. [Joan Greenwood, actress.] 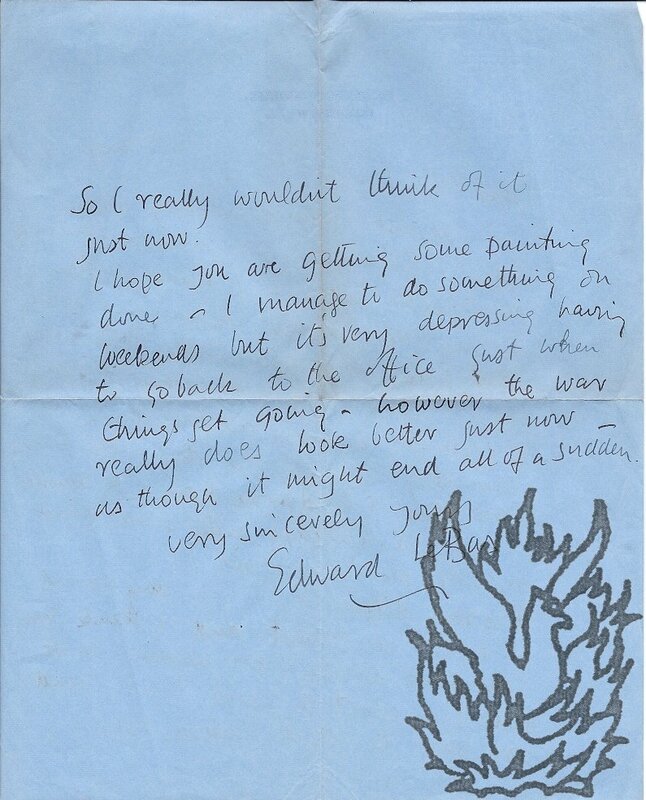 Autograph Letter Signed to the translator Edward Marsh, regarding a 'most interesting and infuriating' 'Cocteau profile', and Henry Sherek's copy of the script of T. S. Eliot's 'Confidential Clerk'. On letterhead of 4 Wentworth Studios, Chelsea, SW3 [London]. 9 September 1953. 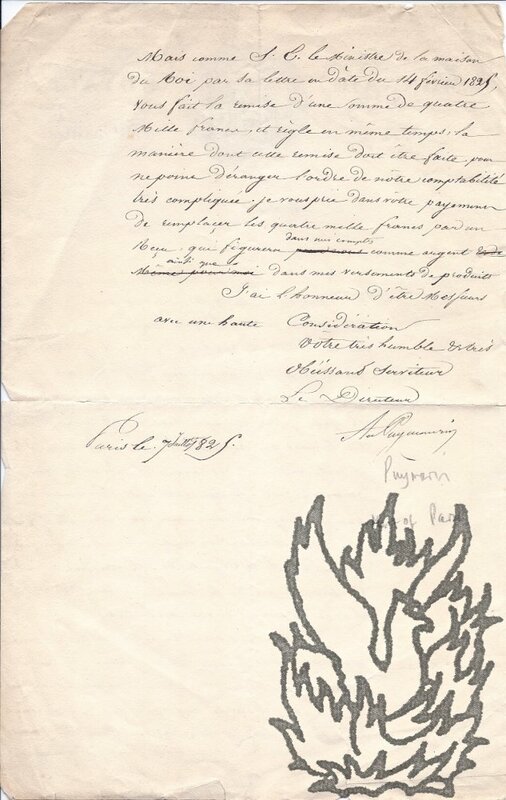 Autograph Letter Signed in French from Jean de Perregaux of Neuchâtel, presenting his cousin Carle de Marval of the Red Cross to General P. Markow, Aide-de-Camp to Ferdinand I, Tsar of Bulgaria, and referring to the Battle of Kirk Kilisse. Neuchâtel [Switzerland]. 5 November 1912. 1p., 8vo, and 1p., 12mo. A bifolium, with the first page (in 12mo) on the recto of the first leaf, and the second page (in 8vo) lengthwise across the verso of the first leaf and the recto of the second. In fair condition, on aged and lightly-ruckled paper. With envelope addressed by Perregaux to 'Monsieur le Général P. Markow | Aide de camp général de S. M. le Roi des Bulgares. | Sophia | Bulgarie'. On monogrammed letterhead, addressed to 'Mon cher Markow', and signed 'J de Perregaux'. Perregaux begins by stating that he was agreeably surprised by Markow's telegram 'de Gare Yamboli'. A small collection of material relating to the adaptation and production of Cocteau's "Les Monstres Sacres" ["The Holy Terrors"], including a Cocteau ALS en francais and Signed Agreement. Circa 20 items, two printed, others typescript and manuscript, various formats including: a. Autograph Letter en francais Signed "Jean Cocteau", 19 Dec. 1952, one page, c.20 x 30cm, to [Edward O. Marsh, translator and adapter], presumably a response to e. below, partly about translation and translators; b. 5 Chemin de Plaisance, Toulon. 12 July 1954. 1p., 4to. In fair condition, on lightly-aged paper, with a few short closed tears along fold lines. He apologises for replying with 'un retard inqualifiable!' 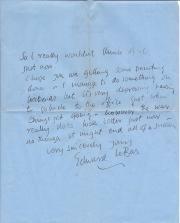 He apologises profoundly for 'ce contretemps' which has not allowed him to thank Mansfield properly 'pour l'Admiration que vous avez bien voulu me temoigner - sans doute à l'occasion de l'un des derniers Salons à Paris'. He is sending a photograph, with his autograph. 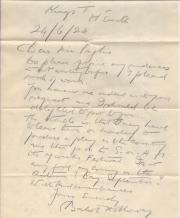 Autograph Letter Signed from the poet Jean Ingelow to 'Mrs Oliver' [Hannah Oliver, wife of Professor Daniel Oliver]. On letterhead of 8 Holland Villas Road, Kensington, W.; 'Thursday' [no date]. 4pp., 12mo. Good, on lightly-aged paper. Ingelow begins by asking Mrs Oliver to thank 'the Professor' for her. 'I am much interested in his singular reproduction of the curious relics of ornament'. She would like to lunch with the Olivers, but 'We have some cousins coming to stay with us next Monday till the end of the week & I do not see how it can be done as they will like me to go about, with them to the exhibitions &c They live not many miles from Kew [where Professor Oliver was Keeper of the Herbarium and Library] & it would not interest them to go there again'. 15 Holland Street, Church Street, Kensington; undated, but after 1868. Five items, including a notebook, containing manuscript notes taken during the Second World War by a member of the First Quartermaster's Department, Royal Marines, Plymouth. Five manuscript items, all in the same pencil hand. The name and address of Jean B. Maclachlan written twice on Item One indicates the identity of the notetaker. All texts clear and complete. Fair, on aged paper (but see slight damage to Item Two). Item One: Manuscript notebook. 12mo, 61 pp. Stapled. In original blue wraps, 'SUPPLIED FOR THE PUBLIC SERVICE'. Repeatedly and untidily stamped in red ink on front cover 'PLYMOUTH', with 'CAPTAIN, R.M. | ASSISTANT PAYMASTER' and 'ROYAL MARINES | PLYMOUTH'. 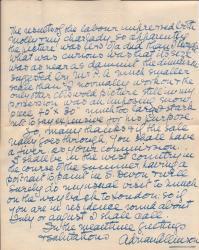 Long Typed Letter Signed ('Mabel Esther Allan') by the children's writer Mabel Esther Allan ['Jean Estoril'] to 'Miss Gilbert', responding in detail to her questions regarding her writing. 19 March 1965; Glengarth, Oldfield Way, Heswall, Wirral, Cheshire. 4to, 5 pp. Text clear and complete. Good, on aged and folded paper. 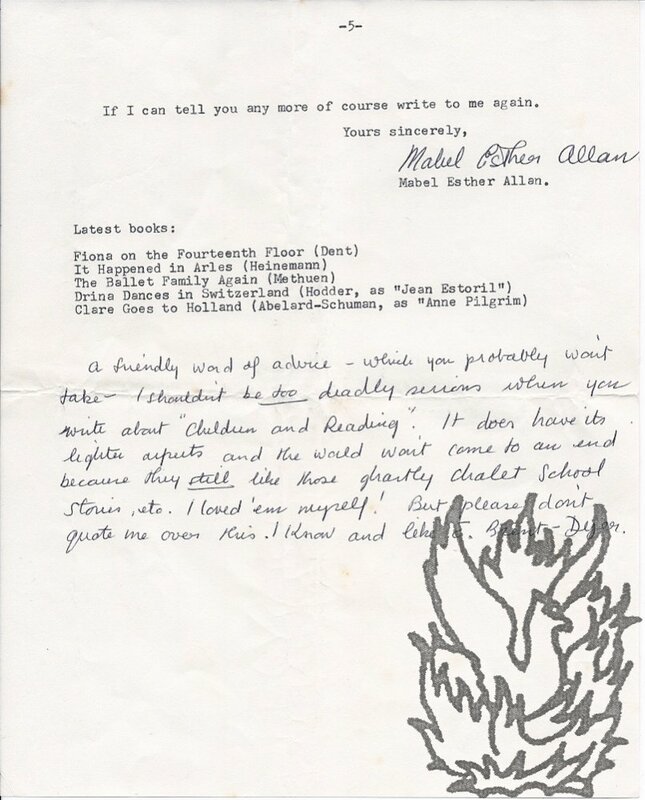 An highly interesting and significant letter, responding thoughtfully and in detail to questions posed by Gilbert (author, according to Allan, of the 'special study, "Children and Reading"'). Begins by responding to the question 'Why do I write for children?' Considers that children's books 'are at least a minor form of art [...] I am a professional author. I have published more than eighty books, all but one for young people. But every book I have written has been written because I wanted to write it, for myself. Percy B. Kahn, composer and pianist, composer of Ave Maria. Page detached from album, stained but writing clear and complete. 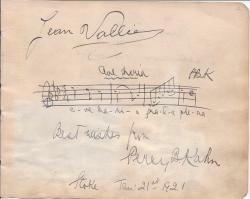 The plain signature of Jean Vallier, French Bass, is followed by the title Ave Maria followed by two or so bars from the song, with words (A-ve Ma-ri-a gra-ti-a ple-na), itself followed by Best wishes from | Percy B. Kahn Stoke Jan 21st 1921. Note: His most noted composition was the song Ave Maria with accompaniment by piano, and violin obbligato. 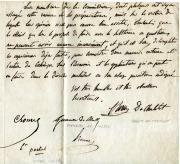 7 July 1825; Paris. On illustrated letterhead of 'Monnaie Royale des Medailles'. Folio, 2 pp. 31 lines. Text clear and complete. On aged paper, chipped at extremities. The elaborate letterhead features a circular engraving by Heuer of two classical female figures in front of a press. 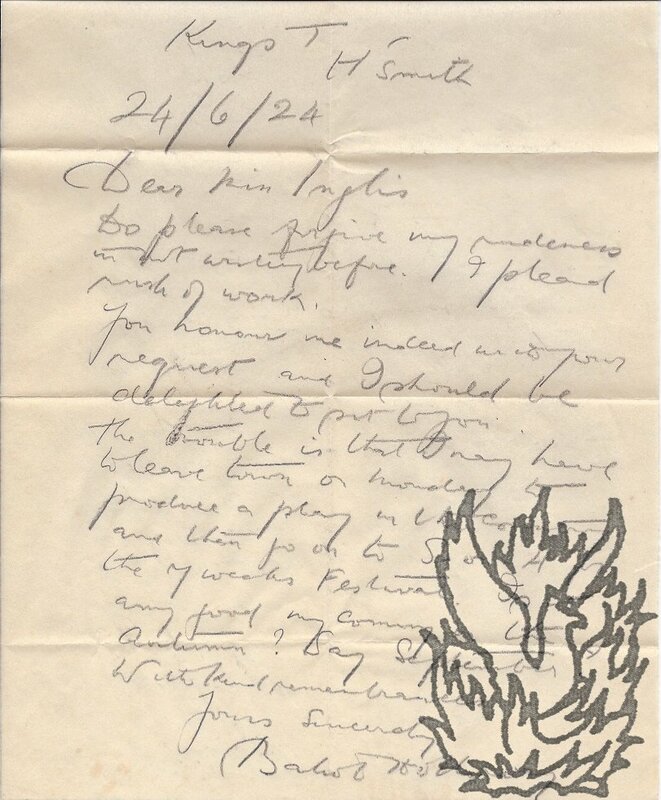 Autograph Letter Signed from the Shakespearian actor Balliol Holloway to the artist Jean Inglis. 24 June 1924; King's Theatre, Hammersmith. 4to, 1 p. Fourteen lines, in pencil. Text clear and complete. Good, on aged paper. In envelope addressed by Holloway to Inglis. He apologises for his 'rudeness' in not answering earlier: 'I plead rush of work'. He would be delighted to sit for her, but 'the trouble is that I may have to leave town on Monday to produce a play in the country and then on to S[tratford]-on-A[von] for the 7 weeks Festival'. Suggests a later meeting. 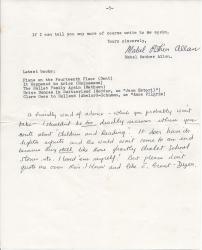 Autograph Letter Signed from the English painter Adrian Allinson to fellow-artist Jean Inglis. 29 March 1956. Postmark of St John's Wood, London. 4to, 2 pp. 46 lines. Clear and complete. Good, on aged paper. He thanks her for putting the commission of 'Mr Proger' his way, discussing the circumstances. 'Just 3 days before I received his letter, while Molly & I were making some sort of order in the Augean Stable which is my lower studio, workshop & general storage place I came across this little panel (a view of Burleigh) which I had thrown asside [sic] as a dud. 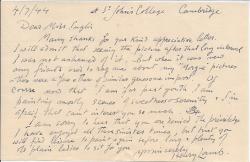 Two Autograph Letters Signed from Edward Le Bas to 'Miss Inglis'. 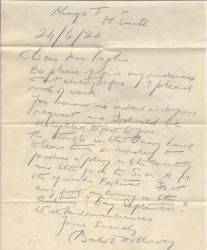 Letter One: 14 January 1934; 6 Fitzroy Square, London. 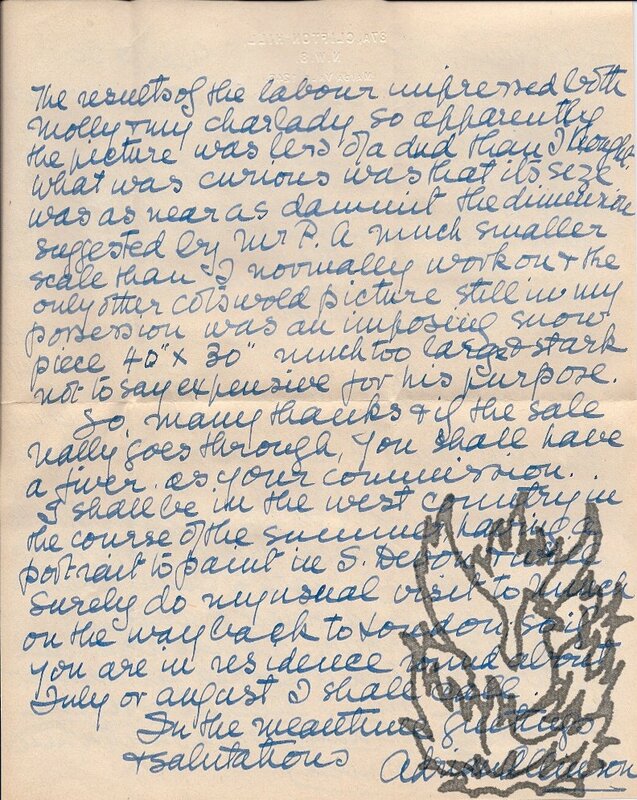 Letter Two:4 August [1945? ]; on letterhead of 53 Bedford Square, London. Letter One: 12mo, 2 pp. Good on lightly-aged paper. The 'delightful drawing' she left for him is a 'wonderful surprise'. He has been 'trying some life drawing direct with the brush' and is surprised that she was able 'to put it down like that!' Letter Two: 4to, 2 pp. Fair, on lightly-aged and creased paper. He apologizes for the delay in answering her letter and thanking her for sending one on by 'Bloggins'. He is 'an abominable letter writer though that does not mean a change of feelings to one's old friends'. He has received a letter f'rom C. B. himself about the Academy'. 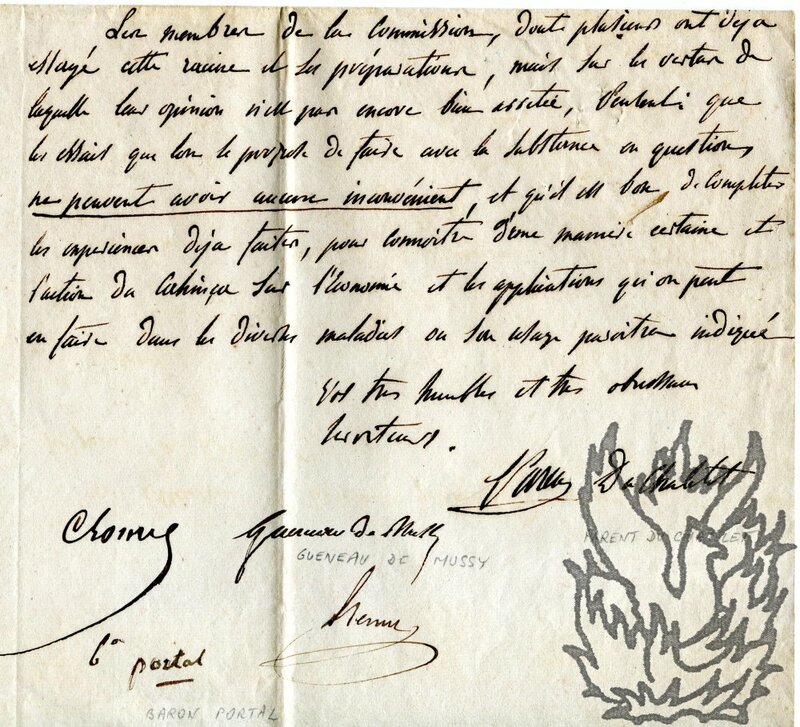 Manuscript Report to the Secretary General of the Hospitals and Hospices of Paris, by a commission investigating the medicinal qualities of the cahinca root. 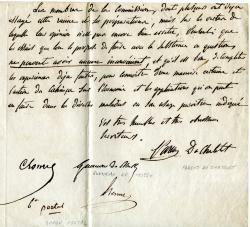 In Parent de Chatelet's hand and signed by him and the other four members of the commission. Foolscap (leaf dimensions 42 x 26.5 cm), 1 p. Clear and complete. On the recto of the first leaf of a bifolium. Both leaves with the small neat ownership stamp of the 'Collections Louis Leguay, à Paris [series A, number 382]'. Good, on lightly-aged watermarked laid paper. Written in French. Addressed 'A Monsieur le Secretaire general des hopitaux et hospices de Paris'. 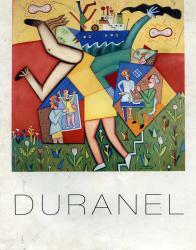 Autograph Letter Signed and three Autograph Cards Signed ('jean Duranel' and 'J. Duranel'), to his patron Lawrence Ives, with two invitations to his shows and a paper cut-out. Between 1982 and 1992; France. 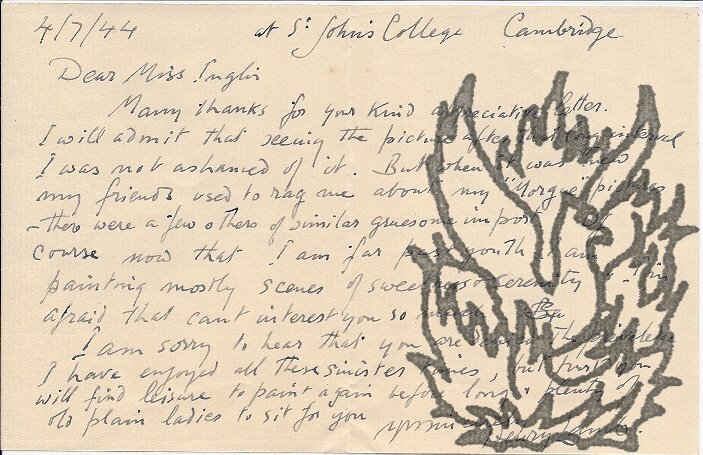 All the items except the cut-out and the last card (in which he gives the price of a painting) are damp-stained, with part of the text of the letter illegible. One card in French. The first card, from 1982, thanks Ives for payment for 'watercolors'. The cut-out, in red paper, is roughly 10 x 10 cm. Intricately-cut, it depicts a long-leaved plant in a basket on legs. Although found with the other items, there is no indication that it is by Duramel. Ives made the news in 2000, when his extensive collection of paintings by L. S. Lowry was put up for sale.